Once again I find myself surprised at the amount of work that reviewing films for the October Horror Movie Challenge takes. A year seems to be just long enough to forget how time-consuming the process is, and my mind reverts to thinking that I can watch a film in 90 minutes then spend another 30 minutes writing a quick review. By the time I get to the middle of the month, and the reality has truly sunk in, I need to remind myself that it’s great to have an excuse to watch a bunch of horror films I’ve never seen. As I watch a lot of horror films all year round, most of these are either newer or less well-known films; sometimes I realise there is a classic I’ve never seen, and the OHMC gives me a reason to rectify this oversight. The Last Man on Earth is almost a classic, and I can’t believe that it’s taken me all these years to get around to it. 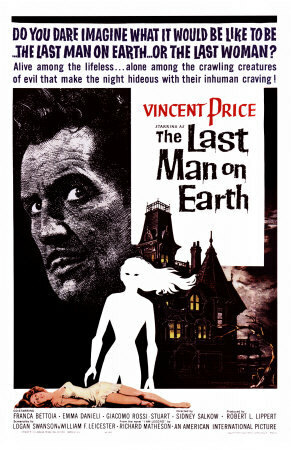 Based on Richard Matheson’s seminal science fiction/horror novel I Am Legend, The Last Man on Earth follows Robert Morgan (renamed from Neville in the novel for some reason), who is, um, the last man on Earth. This is not to say that he is alone: a plague has swept the world, turning the infected into vampires. And this is the key point where The Last Man on Earth differs from the more recent adaptation, I Am Legend — the undead victims in this version are unashamedly vampires, as per the novel. They sleep by day, are repelled by the smell of garlic and find themselves unable to stand their own reflections, but are articulate and largely human-looking. Morgan — a one-time scientist, now turned vampire hunter — knows exactly what to do: hammer stakes through the hearts of every vampire he can track down. Despite being vampires, rather than zombies, the undead here are largely uncoordinated, shambling idiots, making them easy prey. The vampires’ fear of daylight means that there is a real sense of isolation to Morgan’s diurnal existence, as he travels through an empty world, scattered corpses providing the only signs of habitation. When night falls, Morgan is besieged by the undead, further isolating him, pushing him to the brink of madness. It is in these scenes that the film is not only strongest, but most faithful to the novel. Matheson’s original story makes the unbearable loneliness of Neville’s existence a real and painful thing, and The Last Man on Earth comes close to capturing this. This bleakness is somewhat undermined by an extended flashback to the spread of the plague and the fate of Morgan’s family; while affecting, it does change the tone of the film for some time and dilutes the atmosphere it has so carefully created. If there is a flaw to The Last Man on Earth, it’s that it drags slightly, even for what is not a long film. The flashback sequence is overlong and could have made the same impact in half the time. By the time we get back to the powerful ending (largely faithful to Matheson’s book) we have lost some momentum, and it takes a bit of time to reconnect. Still, this is not a major misstep, and the flow of the film largely survives it. The Last Man on Earth, by the nature of its story, relies heavily on its leading man. Vincent Price was not always a subtle actor, and, with rare exceptions, every role he played was pretty much Vincent Price, but he is the right man for this job. He has the presence to keep us engaged for the long periods when he is the only actor on screen, and while he is slightly hammy in places, he manages to convince us of Morgan’s driven nature and his despair. This may be Price’s finest performance. Apparently Richard Matheson disliked this adaptation, and had his name taken off the screenplay. Given how much more faithful and generally successful it is than the garishly over-the-top The Omega Man, which reinvents Matheson’s often subtle tale of isolation and misguided duty as a two-fisted action movie, this seems ironic. The Last Man on Earth may be a bit slow and plodding for modern tastes, and it could certainly have benefited from more budget. The dubbed voices masking the largely Italian cast are a bit distracting at times, especially undermining the emotional intensity in the scenes between Morgan and Ruth Collins. Despite these flaws, The Last Man on Earth stands up for me as the best adaptation of I Am Legend (although this could be seen as damning with faint praise) and a moving, often atmospheric character study. I wish I’d got around to watching it sooner. Hi Scott, I was wondering if you would consider writing reviews for all the films you watch or have seens. Not to the depth of these unless they are in some way standout. I really feel that with your knowledge of sci-fi and horror literature you would make an excellent reviewer of this genre. I’ve been writng one line reviews of films i’ve seen just to keep track of them and its easy and quite entertaining (“Pearl Harbour is the cinematic equivalent of finding a turd in the bath”). There’s at least a website or even a book in your insights. Keep up the good work – Joe Bob would be proud of you!